T type steel grating, also named safe-T-grid grating, is configured with an extruded T- shaped bearing bar and an extruded cross bar - locked together by swaging for a high strength and rigid construction. 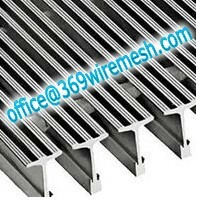 The main materials of T type steel grating are aluminum, mild steel and low carbon steel. The large T-bar surface makes it ideal for pedestrian traffic and an optional choice to close mesh grating. T type steel grating is commonly used for entrance ramps, treads and walkway entrance grates. The standard bearing bar spacing is the measurement of distance between the center of one bearing bar to the center of the next bearing bar. The standard bearing bar spacing for T type steel grating is 1-3/16 inch. The T-bar bearing bars run parallel to the length or span of a standard panel and are responsible for the T type steel gratings load bearing capabilities. The cross bars are primarily responsible for holding the bearing bars together. However, they also play a factor in deflection characteristics, especially for concentrated loads which are not distributed across the span of the grating. The bearing bar height, also known as bearing bar depth, is measured from the bottom of the bearing bar to the top. Standard bearing bar heights are offered in 1 inch, 1-1/4 inch, 1-1/2 inch, and 2 inch. T type steel grating is widely used in the platform, corridor, bridge, well covers, and stairs, fencing for petroleum, chemical, power plant, waste treatment plant, civil engineering projects and environmental projects. Because of its robust design and spanning abilities, T type steel grating is extremely strong and safe for the supportive structures on deckings, mezzanine floors and elevated walkways.